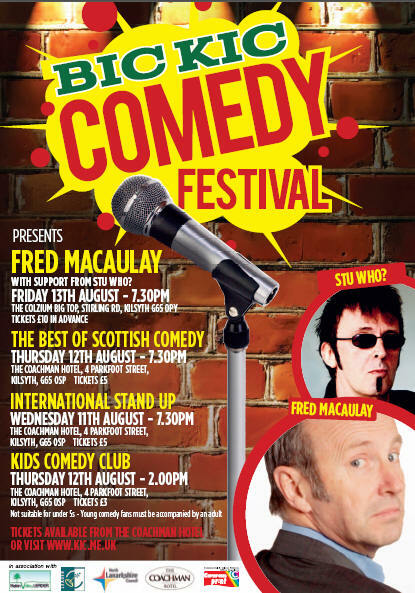 But the Kilsyth Comedy Festival really kicked off on Wednesday 11th of August with an impressive International Stand up! show at 7.30pm at The Coachman Hotel. The line-up included a number of top comedians from around the globe who will be taking time off from their hectic Fringe Festival schedule to bring their unique flavours of comedy to the people of in Kilsyth. Travel the world of comedy for a fiver! A special Kids Comedy Club took place at the Coachman at 2pm on 12th August for young comedy fans aged roughly 8-12. And Caledonian comedy favourites, JOE HEENAN AND GRAEME THOMAS headed up the bill on THE BEST OF SCOTTISH night at the Coachman Hotel at 7.30pm . 11th Aug, 7:30 pm International Stand Up!